RV Living – ever have one of those days? Sometimes our day-to-day lives go smoothly, sometimes less than ideal. But usually they are interesting. And the experiences that stand out the most…are often ones we want to share again and again.Do you have one of those RV moments – something that happened while you were RVing, doing some maintenance or some other RV-related experience? Was it funny when it happened? Or maybe it was a “misadventure”, humorous only in hindsight. Maybe it was something touching, an act of kindness or just something that got you thinking. And maybe it is simply the story of how you live your RV lifestyle. We remember when we were just starting out. We wanted to know about other RVers. We are all curious about how the “average RVer” spends their days. And since we are all a little bit different in how we do things… your story, advice or tips will certainly be of interest to others. Replacing Old Air Bags (No, the suspension type). Who gets locked INSIDE an RV??? For all of you RVers who have never been to Mule Days in Bishop, California you’re missing out on quite an adventure. First, it will test your true ability to be self-sufficient. It is dry camping –no luxuries of home. BUT the good thing is the celebration of Mule Days has so many great events to attend, great food, and very friendly people. Our RV club, California Heartland, from the Central Valley of California attended Mule Days on our last rally. (May- 2016) The weather was hot, the wind blew like crazy, and oh yes, I forgot about the rain. This tested your true RVing ability to say the least. But all and all with wonderful friends from the RV club everyone had a very different adventure, but some very pleasant times visiting interesting places that were nearby. I wish you safe traveling and great memories of your adventures. 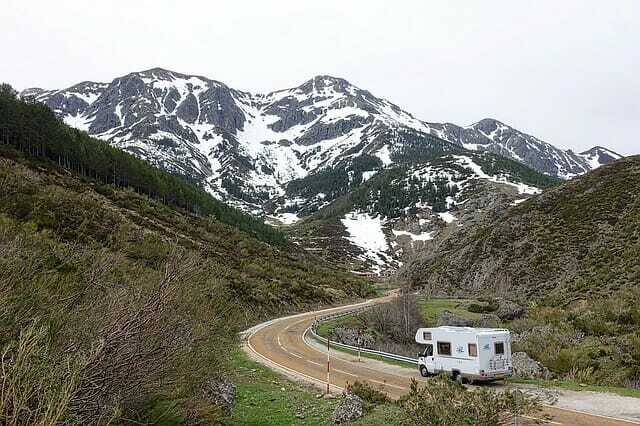 We can recommend a most excellent adventure: RV camping in Europe! While traveling the 101 in CA, going up a sorta steep hill, we heard a loud POP! Instantly we lost power and barely made it over the crest and luckily found a pull off. Very lucky… because a 38’motorhome towing is not easy to park. The motorhome was still running but could barely pull itself. First thing we unhooked the car and my husband went looking for a better place to park and wait for help. Again we luckily found a better spot at the bottom of the hill, so proceeded on down there. We’re frantically trying to get a hold of the tow insurance people who incidently don’t answer phones on Sunday. Again luckily, we were not far from a campground and were able to limp into it and wait 2 days for a repairman to tell us we had blown a hose on the turbo, easily fixed with money! We were lucky, first breakdown in 10 years of fulltime traveling. Not lucky in that our warranty insurance claimed it was NOT a breakdown because the motorhome was still running, although unsafe to drive with lack of power and smoke pouring out the back on hilly 101 highway. Again luckily, being broken down for awhile my husband read our warranty and discovered several minor things that needed fixed and were covered under warranty. Guess who had to pay almost $5000 to fix that stuff? Ha Ha! My husband, Dave, drove our RV to meet some of our friends in Morro Bay for a three-day vacation. Picture this, two guys holding one end of the tent and two inside holding the tent up. The two guys outside kept trying to turn the tent. Soon the two guys inside fell… and down went the tent. It was quite a show to watch. We tried not to laugh too loud so they couldn’t hear us. They did finally get the tent put up, after two hours of struggle and disagreements. The story isn’t over. During the night we heard familiar sounds of animals of the night at the campsite next to us. Yes, it was the teenagers campsite. The next morning I looked out of the window and their campsite looked like a tornado had gone through it. Racoons had made a visit. They told us they had looked out of the tent and saw a family of Racoons. We took pictures for our memory book. You Can’t Bring Horses here! We plan to go fulltime RV living when we retire in 2 or 3 years. For now we own a 4-Star 3-horse slant load with semi-living quarters. Dear Wife (DW) insisted we buy just one trailer and have dual functionality; it would be less expensive than 2 trailers. Smart girl that DW of mine! So we use our horse trailer as a toy hauler and we like to visit campgrounds that have a nice lake. We pack our Old Town canoe and bicycles, grill, etc. in the back horse area (no horses). And the semi-living quarters work just fine. I assured him that we didn’t have the horses with us and opened up the back and gave him a peek at the canoe. Boy, was he relieved and a little embarrassed. He was certain that we must have brought horses into his campground! We all had a good laugh after we were all on the same page of correct information! Even Santa could use a gift from God. About 25 years ago I was a State Park Ranger in South Carolina. I met this older man and his wife riding thru the campground on their golf cart. I can’t remember their names but everyone called him Santa and not only because he looked so very much like him with his long white beard and pot belly, but because of all the joy he gave to others. He would pick up the kids at other campsites and treat them to ice cream at the gift shop on a daily basis. He was such a nice man that everyone liked and trusted him the moment they met him. Santa would take care of his wife and do everything for her as she had a severe case of Alzheimer’s and was wheelchair bound. He would do anything and everything for that woman and do it always with a smile. You would see him taking her for a ride thru the park on the golf cart smiling and talking to her as if it were the first day they met. He would actually show her off to everybody they would meet along the way. Santa and his wife would park there big, nice motorhome in the campground for about a month each year and when the local people saw them come in, they would all come to say hello and greet them and welcome them back. This went on for several years while I was there. Here’s a use for an RV you probably never thought of…. landing a plane on top of your RV! Belleayre Mountain Ski Center, just off Route 28 in the Catskill Mountains of upstate New York offers free overnight parking for RVs. With miles of hiking trails through the Catskill Forest Preserve, bike trails, an interactive nature center, even a lake with a sand beach, Belleayre is an ideal place to stay. entertainment. The Belleayre Music Conservatory www.belleayremusic.org offers up and coming artists and headliners from a wide variety of genres — jazz, pop, opera, and more. All in a gorgeous mountainside setting throughout the summer and fall. No electric, water, or dumping — but no fees, gorgeous views and great music make Belleayre worth the visit. Ten minutes to Supermarket. Half hour to town of Woodstock. George and Alice Bristol are first time RVers who travel from Milwaukee Wisconsin to Southern California. They trace part of the Lewis & Clark Trail. The book, The Bristol Expedition, describes their adventures in RVing. This is also an internet sales site for the book and items of interest to RVers, including MedicTag, a USB medical information device and Solarrific solar products. Today we reside in a fixed residence. The idea of unloading most of our stuff is gaining ground. I like the idea of living with less and retaining the comforts and conveniences of a motor home. As a part of the decision making process, we are investigating possible purchases. This article has greatly elevated the desire to “not cut the grass”, but rather cut and make a run for the state line in a motor home. Thank you for the additional information and perspective. We took our first RV trip on a summer day. We didn’t know which camping spot to pick and ended up picking out one near the bathrooms for convenience. All night long all we heard was people talking and discussing who needed to go and did you ask the kids if they didn’t to go and hurry up and come back because Johnny really needs to go bad and hadn’t gone all day and is really constipated. Oh, what fun to sleep near the bathroom! My husband & I had just purchased our first 5th wheel, a 2000 Coachman with one slide. When we towed it in, leveled it, we opened the slide out so my parents could see the inside. I tried not to laugh but gently told him that the room slid inside & locked when we were towing it. Took the camper in to dump the black and grey water… Had the cheapest hose I could find and the camper had a hard-to-reach dump valve. Well, in order to connect the hose I needed to sit on the ground and reach way under the unit. As quickly as I could (which seemed like hours!) I shut the valve off and hosed myself off. That was not really funny at the time but it gets funnier as time goes by. If you love looking at wildlife up close, you need to go to Elk/Cameron Counties in Pennsylvania. Elk have been reintroduced to this state in these counties and they are abundant. You can get within several feet of these magnificent animals. The racks on the males are huge and to hear them bugle is goose-bump worthy. We even had two giants run through the campground we were at a couple of years ago and we listened to them bugle for a couple of hours after that. Great photo ops and just when you think you have seen the biggest elk you ever saw, a bigger one comes along. The third weekend in September is the Elk Fest. Lots of interesting stuff there, too. If you go, make sure you have your camera charged up as you just might see a couple of bulls fighting for the harem! RV clubs benefit RV wannabees, new and experienced RVers. Choose from many clubs for campground discounts, rallies, magazines, services ideal for RVers, and more savings. Plan a budget for RV costs. Estimate RV costs, financing, insurance, and living expenses. Enjoy your RV lifestyle more by planning ahead. RV internet access is important while RV living. Many fulltimers want fulltime access and even part-time RVers want to be online and send email. How to stay connected is another RV lifestyle choice. RV Rentals: Try before you Buy: Guide to renting RVs. A great way to try out the RV lifestyle firsthand, travel, and see new places. Advice and resources for renting. The RVer has lots of options for things to do. Choices include hiking, fishing, camping, golf, cycling, kayaking, line dancing and more. RV Living as Fulltimers: Ever wonder about the Full-time RV Lifestyle? Explore the many ways to RV full time.